The Kensington Wooden Stool Grey Velvet is a majestic piece of furniture. A regal treat, the Kensington is a splendid design that will add some royal affluence to your kitchen or bar area. Luxurious grey velvet gives the seat soft comfort, which is enhanced by a belted support and chrome studs border the seat for chic detail. The backrest has a beautiful curved designed and is decorated with quilted buttons, chrome stud edging, and a matching chrome ring on the rear. Four solid wooden legs have a charming dark wood finish, lending a natural warmth to this fixed height model. Wooden bracing bars provide a footrest, and each tapered leg is capped with a protective floor plug. "These bar stools are stunning and comfortable"
Chairs were perfect for my kitchen island, height was right & the chairs very comfortable, not always the case with these kind of chairs. I would recommend them for style & comfort. 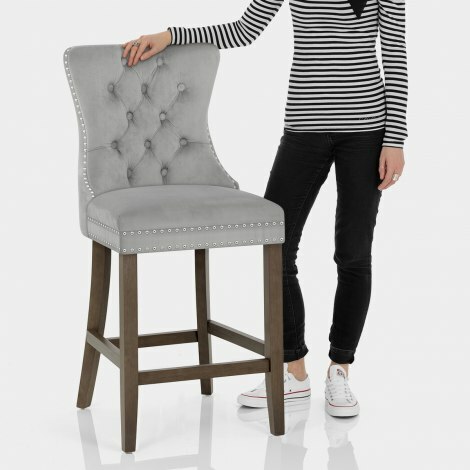 These bar stools are stunning and comfortable to sit on. I’m very happy with them. Just what I wanted for my new kitchen. Arrived next day and we’re easy to assemble plus the tool needed for assembly was in the box. I am really happy with these bar stools, have received many compliments! Easy to assemble also! !